RMDV II-SB (c21913) Twisted Pair Series cable with Dyden’s special elastomer for flex- and abrasion-resistance. The RMDV II-SB series uses copper alloy for the internal conductor and special Dyden-developed elastomer for the insulation. The elastomer provides high flex resistance and abrasion resistance and reduces the diameter. Compared to the RMDV conductor, this cable has better durability due to high mechanical strength and stiffness. 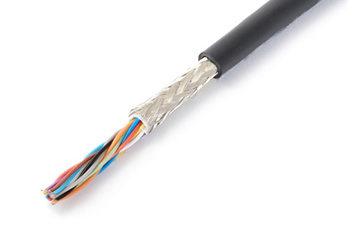 The cable’s sheath uses PVC for excellent flame retardancy, oil resistance, and flexibility. A braided shield prevents outside electrical interference.